Orders placed before 14:00 are shipped the same day. Orders placed after 14:00 are shipped the following business day. Orders paid via bank wire are shipped the same day the payment is credited to out account. You will be informed when your order will be shipped via email. We have all the goods in stock and thus can be shipped immediately. Discretion is our priority, the packaging will never give any hint of what's inside. 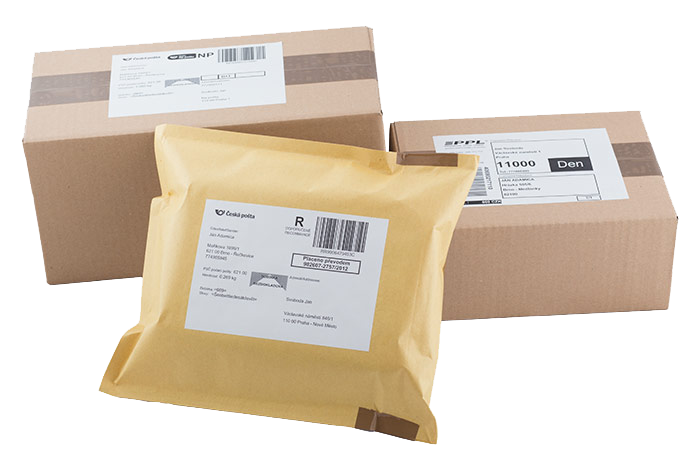 For orders over 850 CZK, the delivery is free of charge via the Registered Mail of Czech Post. For orders over 1500 CZK, delivery is free via Czech Post, Mailbox, PPL and Express Courier. Address: Novoměstská 2, 62100 Brno. Every day 9:00 - 17:30. You will be notified by email when your order is ready. Registered letter of Czech Post - 39 Kč - FREE over 850 Kč. You can pay for your order either via cash on delivery (COD), bank transfer or online transaction. Delivery time is 1-3 business days. You must have your mail box and door bell marked by your name. Parcel To Hand by Czech Post - 89 Kč - FREE over 1500 Kč. We will provide descreet skipping in a brown cardboard box. Delivery to any address in the Czech Republic. Once your package has been dispatched, we’ll contact you via email or text message and share some neat order details like order number, and you can track it in the Czech Post online system. If the postman doesn't catch you on your delivery address, the package will be stored at the your post office. You'll find a note in your mailbox. Post Office Parcel by Czech Post - 99 Kč - FREE over 1500 Kč. Package will be delivered to Post office which you can choose when ordering. You will receive email and SMS info when package is ready for collection. Delivery time is usually 1 business day. Zásilkovna - 49 Kč - FREE over 1500 Kč. Should you find your goods damaged or inappropriately handled, please, contact us. PPL (recommended) - 69 Kč - FREE over 1500 Kč. Orders up to 1500 CZK: 69 CZK. PPL guarantees delivery to your home the next business day after the order has been shipped. I.e, if you order the goods on Monday before 14:00, you can expect it on Tuesday. You will receive an email with the package number and the time of delivery. The most reliable and fastest delivery method. From our own experience, we recommend PPL over Czech Post especially around Christmas time. On the day of delivery, a PPL courier will contact you in the morning and arrange the exact delivery time. You can simply stay home and the goods will be delivered to you at the very time you want to. For this delivery method, you must enter your valid phone number where the courier can reach you. You can track your order on the PPL website (www.ppl.cz). In the "shipping tracking" field, simply type the parcel number that PPL sent you via email and then click "OK". Express Evening Currier Prague and Brno - 79 Kč - FREE over 1500 Kč. Orders up to 1500 CZK: 49 CZK. Only for Prague (ZIP codes beginning with 1) and Brno (ZIP codes beginning with 6). When ordered during business day until 12:00, orders will be delivered 18:00 - 22:00. We want to make sure that you can choose the delivery option that suits you the best and that your package arrives as fast as it can. For the fastest delivery, we recommend paying online via card or COD and PPL courier service. If you order the goods before 14:00, it will arrive the next day. Our Prague and Brno based customers can use the Express Evening Courier, which will deliver the goods the very same day (for orders made before 12:00 noon). Online payment via card or COD make the delivery time faster. We recommend the PPL courier service which guarantees the delivery on the following day. Orders placed before 2pm are shipped the same day. Please note that bank transfer payments may take up to a few days. We hold stock in a warehouse and all the goods can be shipped immediately. You will be informed about the shipping via email.